Bordered by stunning mountain ranges with dense forest to the shoreline and calm, deep waterways, the Inside Passage is a 1500 kilometre waterway extending from Seattle Washington to Skagway in Alaska. Most commonly claimed by the Alaskans because of its enormous tourism appeal, the sheltered waterways were originally explored by early navigators as a way to escape the dreadful weather in the Pacific Northeast. Very soon tales of this most agreeable land and the favourable passage were widespread in maritime circles. Alaska’s portion encompasses over 1000 islands, 24,000 kilometres of shoreline and thousands of coves and bays, while British Columbia’s share is of similar extent. Today, during the northern summer, the seaborne traffic through the passage gets pretty hectic. Enormous cruise ships, each carrying some 2000 passengers, loaf along the tranquil waters, soaking up the crisp air and eye-popping scenery. Stopping occasionally at the little villages and towns, the enterprising locals are eager to embrace the cashed-up tourists. Alaskan Inside Passage cruises are overwhelmingly popular, easy on the motion-sensitive tummy, and overflowing with magnificent scenery and fun shore excursions. But the big ship experience barely scratches the surface of the wondrous nature and wilderness possibilities hidden away. 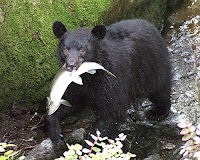 For example, one of the most rewarding wild bear encounters can be had from the little hamlet of Wrangell, normally a two-hour whistle-stop on a cruise ship itinerary. Jump ship for a day or two and stay in one of the comfortable B&Bs or inns dotted around town. Call into Wilma and Jim Leslie’s office right on the wharf and book the Anan Bear Experience. A full day adventure, you’ll be whisked out by jet boat to the unfenced sanctuary about an hour out of town and be ogling wild bears fishing for salmon in no time while bald eagles weal overhead in swarms. Breathtaking. Otherwise check out some of the small ship, adventure cruise options available from such operators as CruiseWest and American Safari Cruises. These vessels carry as few as a dozen passengers into some of the most remote and secluded nooks and crannies along the passage where you can get up close (but not too close) to calving glaciers while escorted by pods of orcas. Fishin’ folk will also enjoy the famous halibut and salmon fishing that abounds throughout the passage. Apart from the enormous variety and scope of natural attractions, there is a refreshingly new perspective on indigenous tourism in Alaska. “First nation” families run many of the museums and guided tours in and around the little towns like Petersburg, Ketchikan and Wrangell. Be sure to see the museum and Chief Shakes house in Wrangell for an insight into the life of Alaska’s first residents. Other activities to consider include guided trekking, kayaking, flightseeing and camping. Experienced kayakers can enjoy some of the best open water and river kayaking anywhere in the world, but wilderness paddling and camping needs to be taken seriously. The water is cold and the wildlife can be, well, wild! But all this high adrenalin adventure may be more than you bargained for. Another popular way of seeing the Passage and the little communities that thrive there is aboard the Alaska Marine Highway. This regular and comfortable ferry service binds the otherwise isolated townships into one large community. It’s easy to bounce from one island and town to another, lazily enjoying the local attractions and atmosphere without enduring the tourist throngs that invade occasionally when the liners are in town. By all means take that big ship cruise and enjoy all the comforts and facilities on that glorious, 5-star vessel, but take time out to explore and discover Alaska’s Inside Passage at your own pace away from the commercial frenzy – that’s where you’ll find the real Alaska and the greatest rewards.